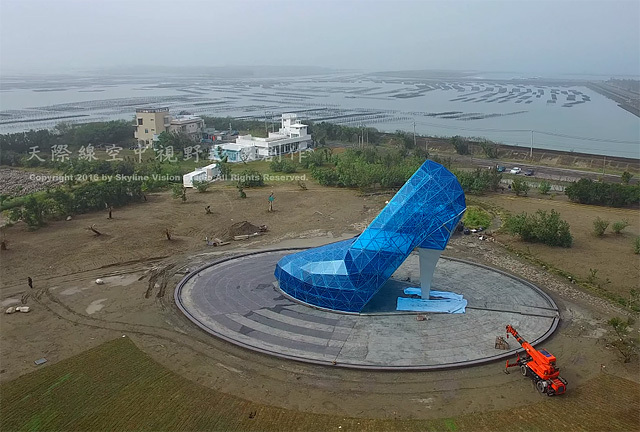 In an attempt to attract more female visitors, a church in Taiwan has been built like a gigantic high-heeled glass shoe in a beautiful crystal blue color. Erected in Ocean View Park in Budai town, along the east coast of Taiwan, the church took two months to build. Measuring 55ft tall and 36ft wide, the colossal slipper is made of 322 pieces of blue glass. Zheng Rongfeng, a spokesperson for the Southwest Coast National Scenic Area, told local news website Huanqiu.com that the church was designed to draw in "female worshippers". The new place of worship will also apparently house "100 female-orientated features," including biscuits and cakes and a lovers' chair for couple's to take wedding photos together. Image credit: Copyright by Skyline Vision Studio.